Everyone wanted something a little different after the holidays – and hockey was the ticket – literally. 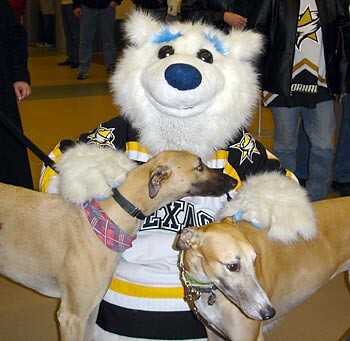 For the price of a ticket you could see the game and enjoy a hot dog, chips, and a drink – plus see Greyhounds. Banjo and Hydro particularly enjoyed the attention. Thanks to GALT volunteers, Joanne Smith (with Shimmer), Deborah Canterbury (with Missy), Jayme Skelton (with Hugo), Kelly Watson (with Wave), Scott and Susan Hurst (with Hydro) and Chris and Jennifer Henager (with Banjo), and thanks to all of GALT's supporters – hope you enjoyed your evening.